It's the Thanksgiving holiday here in Canada today, so if you're celebrating, I hope you're spending the day with great company, and of course, lots of turkey. I don't know about you guys, but every. single. 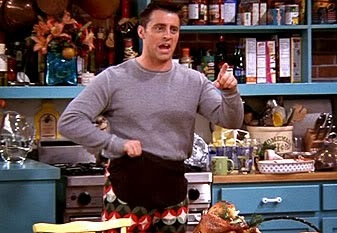 time I think about Thanksgiving, my mind automatically flashes back to this. Oh how I miss that show! I'm celebrating the holiday a little different this year and actually working. I have no idea why I just used "celebrating" and "working" in the same sentence, but anywho. We have a deadline at work that has to be met by the end of this month so they've been encouraging everyone to not take any time off besides our normal weekends. Another thing that's different this year is that I'm not spending the holiday with my parents because they're visiting my sister in Toronto right now. I guess I'll let her have them....this time. And since I was not prepared to cook a turkey by myself without any direct supervision, it also means that I will not be doing my usual; stuffing my face and then sleeping the afternoon away. Regardless of all of that, I have so much to be thankful for. You know, before I sat down to write this post this morning I had a plan that I was going to list off everything that I was thankful for. The truth is, though, that I don't need to broadcast a huge list because I'm thankful for the simplest, yet most important thing, and that is the health of myself and my family and friends. After all, nothing else matters without that. Oh, and today is also special because it's my mom's birthday and there really are no words to describe just how thankful I am for having her in my life. So mom, if you're reading (which you better be!!! ), happy birthday! I love you more than anything and I can't wait for you to get back home so we can celebrate together! Wow I didn't realize you celebrate Thanksgiving in October in Canada! I'm sorry you have to work though, that stinks! For the last 4 years, my bf and I have been going to my aunts for Thanksgiving, then going to a second dinner at his parents house afterwards.. Needless to say I am stuffed by Thanksgiving night! This Thanksgiving has been different than what we're used to. The past 3 years living in the states I made Canadian thanksgiving dinner for all of our American friends. This weekend I got to enjoy someone else making dinner for me. And we had prime rib instead of turkey! It was definitely a different Thanksgiving, but sometimes I welcome a change. Sorry you had to work on Thanksgiving! Happy Birthday to your Mom. I don't eat Turkey so I usually have ham on Thanksgiving, but it is filled with family, food, and lots of laughs. Perfect in my book. I didn't know Thanksgiving was celebrated in October in Canada. Hmm learn something new everyday. Happy Birthday to your mom! She is birthday buddies with my husband! Boo to working on Thanksgiving but you're right, you gotta do what you gotta do! I'm hoping the weather has been as gorgeous there as it has been here this past weekend. It feels like summer!!! 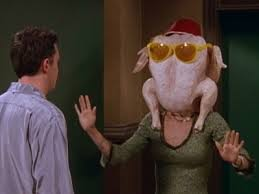 Okay, I had completely forgotten about that Friends episode...now I need to go back and re-watch it! Too bad you had to work on Thanksgiving. Hope it was a great one anyway!